Creation: Creation is the starting of the document lifecycle. Here a document comes into existence in an analog form or digital format. Capturing: This process involves the conversion of a physical/analog document into digital form using technologies like OMR, OCR, ICR and Scanning. If a document is already digitized during creation then this step in the lifecycle is skipped. Index: This process involves the creation of identification for the documents, this is commonly known as cataloging. Metadata is created during this process using any manual or automatic methods and tools. Metadata is simply defined as a description of some other data. Manage/Storing: Once the documents are cataloged they are stored in data warehouses, archives and other storage systems. While this process is in the works it is very important that the documents are stored properly so that they are readily available with high accessibility. Access: In this process the documents that were stored earlier are searched using text, metadata and other search tools. Search tools can include search engines and data mining. Retrieve: In the document lifecycle, retrieve refers to the task of viewing the search results using different methods. Administer: In a document lifecycle administer usually refers to the management of users who have access to the documents, content of the document and media structures. Tools involved in administration usually include media management tools, backup technologies and records management tools. Repurpose: One of the stages in a document lifecycle is repurpose or versioning and re-versioning. Basically if any changes are made to the previous version of a document then a new document is formed which is unique from the previous one and thus the process of versioning occurs. Moreover it can also include the reusing of documents for other purposes. Collaborate: Collaboration and sharing is an important part of a document lifecycle. Let’s assume that you want to share a specific document with a workgroup or another organization. This process of sharing of documents with other entities is called collaboration in document lifecycle. Tools for sharing can include e-mail, instant messaging and digital conferencing. Distribute: Simply the transmission of documents in a secure manner is called distribution in terms of document lifecycle. There are variety of tools that can be used for distribution purposes that include printing, Digital Media Publishing, Report Generation and CD/DVD. Retain: Retention involves holding the past data for a specified period of time. The historic data is also called legacy data and it is stored using tools like Digital Records Management, Automated Format Transformation, Data Migration and Data Warehousing. Dispose: Sometime documents are considered sensitive and after their retention period is complete they are securely destroyed using tools like Shredders and DOD-Level data destruction. This marks the end for some documents however other documents go through one final stage called preservation. Preserve: Some documents that are valuable and demand usage for a longer period of time require preservation. The accessibility to these documents are long-lasting and sometimes indefinitely. Tools and techniques include standardization and portable document formats. All or most of these elements make up a document lifecycle depending on the nature and type of the document. Stay tuned with the latest on DM System and learn more about iDOX Document Management System through our daily resources. A document lifecycle starts with the creation of a document in electronic format. The creation can take place electronically or the paper document can be scanned to convert it in digital format. 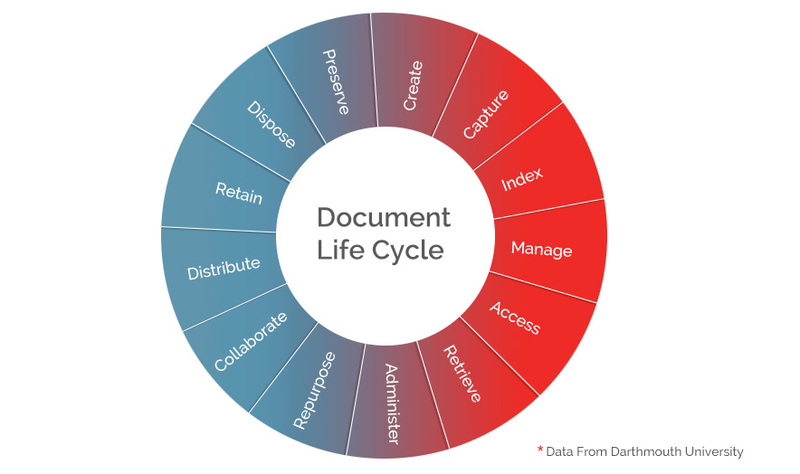 The four major stages in a document lifecycle include scanning, indexing, storage and retrieval. Further to these, there are other sub stages within the document lifecycle. A good document management system functions on a similar lifecycle to ensure that documents are managed properly and effectively.